“I first met Richard back in 1994 when he joined the same Tae Kwon-Do club as me and it soon became apparent that his passion for success would and did lead him to several national titles including British Champion. He also went on to compete at international level. During this period, Richard studied to become a personal trainer and sports injury therapist and shortly after, 121-Training was formed. I first employed Richard’s services when i started getting a lot of pain from a tight calf muscle. I gave him a call and he agreed to come and have a look at my leg for me. Straight away he diagnosed that the problem was not my calf but actually my hamstring and within in a few sessions of deep tissue massage, simple stretching and re-education to a particular movement, i was able to cure the problem. More recently, i have used 121-Training in a bid to get myself back into shape. After years of unsuccessful dieting and the same old routines at the gym, i felt it was time to give Richard another call. After the initial consultation, Richard assured me that he understood exactly what my goals were and what i wanted to achieve. 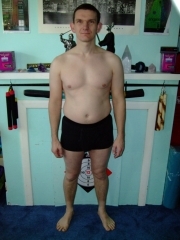 He then recorded my body weight and took my fat reading and i was surprised to learn how badly i had let myself go and that i had become clinically obese! I wanted results and i wanted them sooner rather than later, so i signed up for 121-Training’s platinum package - 3 times a week for 12 weeks! For me, this was a massive investment to make, but i had total faith in Richard and it more than paid off! As well as teaching me to enjoy my food without having to eat till i pop, 121-Training has provided me with a refreshing new approach to training which is set in the great British outdoors. I’d like to leave you with a picture of my success. You can see how much body fat I have lost and how toned i have become in just 12 weeks of training. In the words of Richard Rempel “You’ve got to want it to achieve it”!